"Cute as a Button" was the theme for the shower. It all started with a book of scrapbook paper with fun orange, yellow and pink colors. I then found a pack of buttons at the same craft store that matched the paper perfectly. From there on and the help of my family, everything fell into place. I created the invitations from scrapbook paper. There were a total of 5 different invite designs- it was fun to not have them all the same. 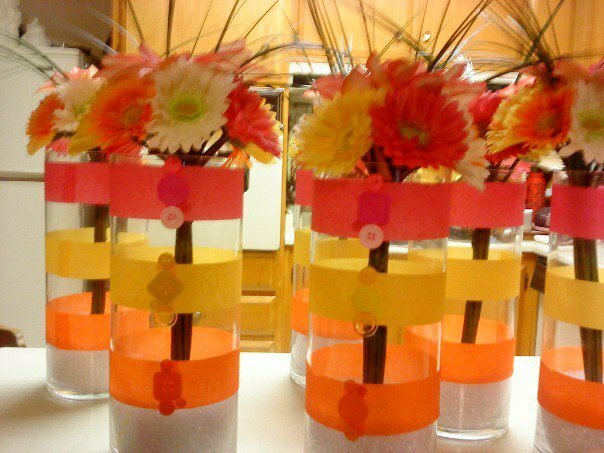 The sign in table centerpiece was a vase wrapped in ribbon I found at a craft store and the branches were a find at a discount store. I glued silk orchid flowers to them for color and filled the bottom of the vase with matching flowers I found at Michaels. 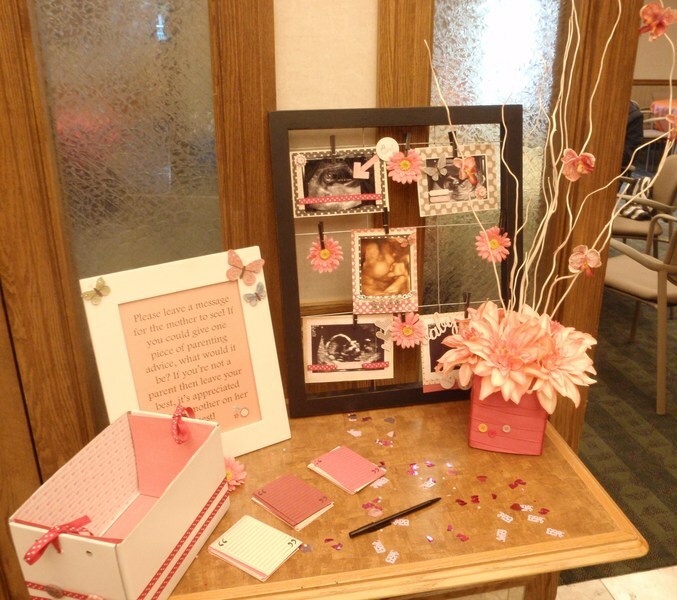 The sonogram pictures were decorated with scrapbook items and will later go in a scrapbook with the comment cards. I found the decanters on clearance at a Home Store and added the ribbon and drink cards from left over card stock I had from the invitations. 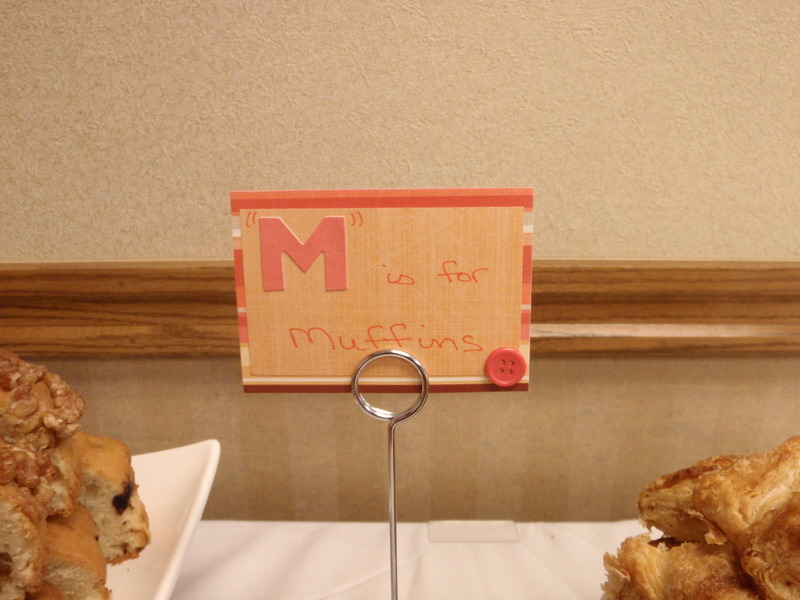 Same with the meal cards, they were created from left over card stock. 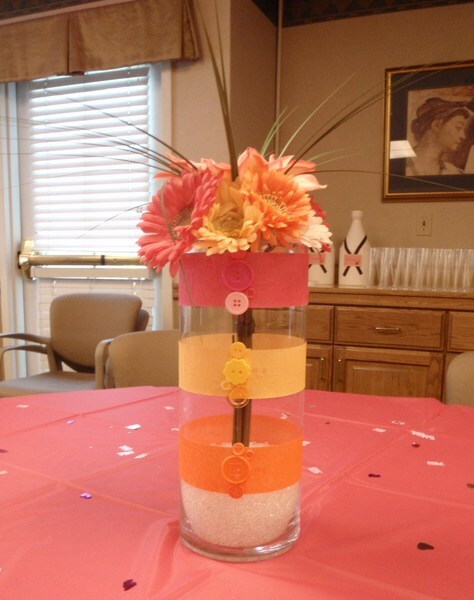 I love the centerpieces that my cousin put together. We found the streamer idea in a Martha Stewart magazine. It gives the vase added color. 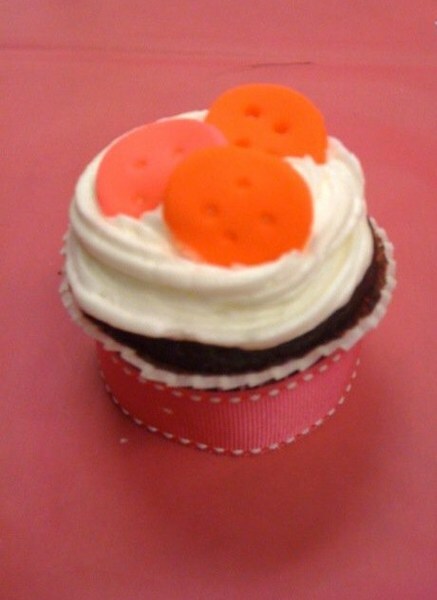 She also did the cake and cupcakes- love the fondant button details. Pay attention to detail~ small details go a long way! I just love those invites. Very easy to do, yet very (pun intended) inviting! And that frame with the ultrasound photos is just heartwarming :) But my favorite has to be those flower vases, very unique and stylish! Thank you for your comment! It was so much fun putting everything together. And yes, my cousin did a great job with the centerpieces. I’m glad you like them! How did you make the sonogram picture frame?